Found in "Lucille" by Owen Meredith. Published by Crowell, 1885. I'll be giving away this book and illustration tomorrow (January 22) at 3:00 PM EST, so comment in this post to enter. So pretty-- both the book and the art. What a lovely book and card! It's so period. What an awesome find! I'll cross-stitch that picture. And the book is quite remarkable, too. Thanks for sharing! As others have said - how lovely they both are! Both the book and bookmark are a lovely reminder of times gone by. I'm wondering who "Lucille" was and what the book has to say about her. Is it fiction, biography, autobiography or maybe even poetry? I love the book!!! I am a sucker for old books! I love the feel and smell of old books. Awesome give-away! That would be a great prize to get! I've never heard of the book nor seen the art work before, but I'd really like the book for it's cover (they wouldn't be separated)! I'd like to enter. (assuming you take overseas entries...) The book has an interesting story behind it, and it's such a pretty edition. Thanks for posting your finds. I love their randomness and the connection they have to the books they're found in. Oh my, They are both so beautiful!! Are you including the bookmark? snuggle - the illustration (bookmark) is included. Just beautiful - the book and the card. Both the book and the illustration are beautiful! I'm the Director of a historic library on Cape Cod, and we love old books...in fact I have a collection of found items that come from books that people return or donate to us. It's a wonderful glimpse into people's lives. I linked your blog on our staff blog so that others could enjoy it, too. Lucy, can I come visit? I love Cape Cod. Gorgeous postcard and book binding - although I'm curious as to what the book is about! both are fantastic and I'd love to make them part of my bookshelf. These are both pretty. I would be a proud owner! Oh! Those are both lovely! Thanks for choosing these for a give away! What a beautiful illustration and book, I'd gladly give them a home. I'm sure I could find a very nice frame for that. Thanks for the chance. I love this book and "bookmark". 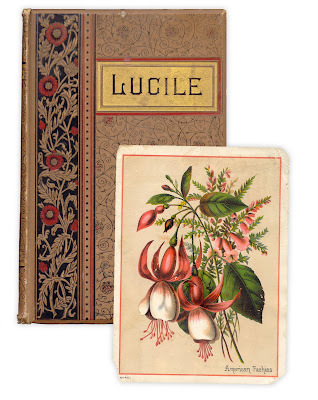 The book is so pretty and vintage botanical prints are a fav! I love the illustration. Fuchsias are my favorite flower! Gorgeous flowers and they pair well with the book. I'd love to toss my name in the hat. Have I missed the deadline yet? I love all the things you find and share!! My wife would love this. Don't forget about me! Perchance 'twas the fault of the novels they read." What a charming book. I'm glad for the lucky person who won it. My Grandmother's name was Lucille. I didn't know that there was a book like this one.